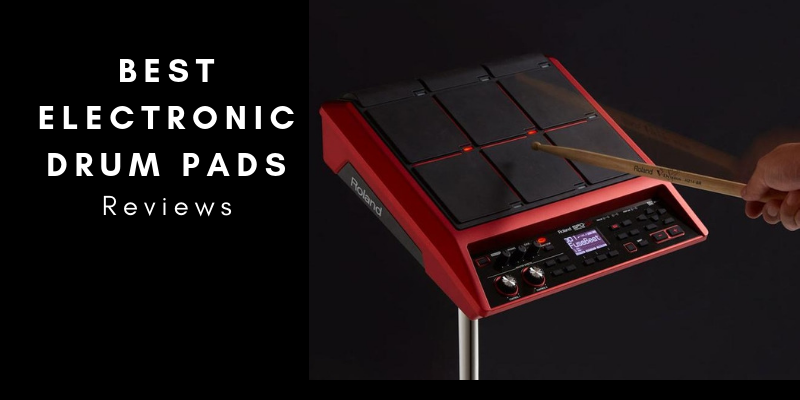 Our article today will be taking you through the various electronic drum pads currently available in the market. Trust us, there is a wide plethora of them in the market but we’ve cut through the chaff to select only the best of the best for you. Electronic drum pads are a great way to expand the setup you currently use. And even on their own, electronic drum pads still work well. 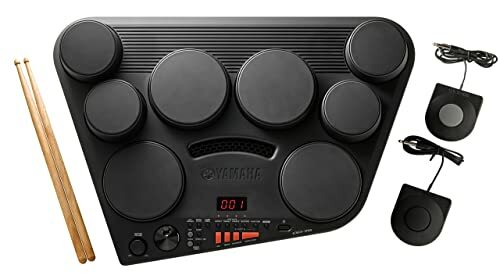 Also, because electronic drum pads generate their sound internally, you can connect your pad directly to an amp. There’s just so much you can achieve with electronic drum pads! But this would be at what cost to you? Well, prices vary and naturally, the higher end pads are more superior to entry-level models. All the same, we made sure to make the review a mixed bag so everyone gets something. Now, without further ado, let’s get this show on the road. The Pyle Pro Electronic Drum Kit is one of our favorite electronic drum pads of all time. It is an amazing drum pad that works for both beginners and experts alike. Plus, the price tag on this model is just right so it’s affordable for most. This drum kit packs a whole lot of functions which we are going to discuss briefly. Firstly, this is a 7 pad drum kit. So, there’s a snare, 3 tom drums, 1 hi-hat and 2 cymbals. Hence, as you can this is a pretty versatile setup as it closely mimics what you find on a full drum kit. In addition to these pads, this kit also includes 2 foot pedals with one acting as the hi-hat pedal and the other for the kick drum. This makes the Pyle Pro Electronic Drum Kit resemble a full kit pretty closely. Furthermore, the Pyle Pro boasts one of the widest variation of sounds we’ve seen on a beginner drum kit. There are 300 on-board sounds with 55 preset kits. But that’s not all, you also get 10 slots to upload your own samples onto your drum pad. For inputs, there’s an aux in to connect other external devices. And for output, there’s the jack which allows you connect your headphones or an amp. There’s also another output for you to connect a USB cable so you can hook your pad up with your computer. The Pyle Pro Electronic Drum Kit is super convenient and flexible too. Although it comes with an adapter to power your device, there’s also a wireless option. You can run your device on 6 C batteries if you need to go wireless. You’d have to get the batteries yourself but all the same this remains a sweet deal. A large variation of preset kits and sounds available. 10 preset slots to tailor your sound the way you like. Built-in metronome to learn time keeping. Comes with a learning mode which also includes an LED display guide. Helps the beginner practice timing and groove simultaneously. Also features a built-in recording function to record and evaluate performance. Pedals tend to move around while playing. Fix that by placing the pedals on any small flat piece of carpet or something similar. Next up is the Yamaha DD65 Electronic Drum Pad Premium Package. It’s a true premium package as it contains a lot of exciting features. For one, this contains 8 pads, which is one pad more than the last kit we reviewed. What else is here? You’d have to keep reading. First, the 8 pads here include a snare, 3 tom drums, 1 hi-hat, and 3 cymbals. Also, there are two foot pedals in the package which are for the hi-hat and kick drum respectively. Still on the layout here, you’ll find two stereo speakers which help to reproduce your drum’s beautiful sound. Alright talking about sounds, this comes with 50 preset kits and 254 sounds. That’s a lot of sound, although not as many as that of the Pyle Pro. It’s still a great variety though. As for inputs, there is a quarter inch input which allows you to connect external devices like your phone. 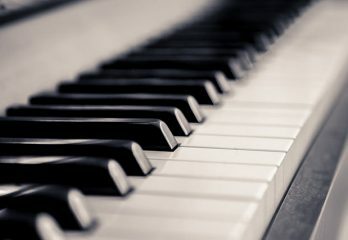 This way, you can play along with any music of your choice. There’s also another quarter inch jack but this time, it’s an output for headphones or an amp. Yeah, let’s not forget the MIDI output too for connecting to your computer. It’s a bit old school though which we find inconvenient, especially since you’d have to get a converter to be able to connect your pad to your computer. Anyway, the Yamaha DD65 also comes with a flexible power requirement as the Pyle Pro. It can run on an AC power adaptor which Yamaha already included in the package. Also, it can run on batteries if you ever need to go wireless. The batteries are not included, of course. Finally, LED control panel is another feature we love here as it makes it easier to interact with this drum pad. This kit comes with 8 pads. Pads are highly responsive and accurate too. Control panel is pretty intuitive so you can begin playing this thing right out of the box. Also comes with headphones in the package for a quiet practice right out of the box. Sound quality here is great. Comes with MIDI in and out outputs rather than USB. So, you’ll need a MIDI to USB converter to hook this up with your computer. A little overpriced considering this inconvenience. Plus, its sound quality is still on par with the Pyle Pro. Now, the Alesis Comapctkit 4 is a drum pad for kids, in our honest opinion. So, you might want to adjust your expectations a bit before taking a look at this model. It isn’t something that even an adult beginner might be able to use satisfactorily. 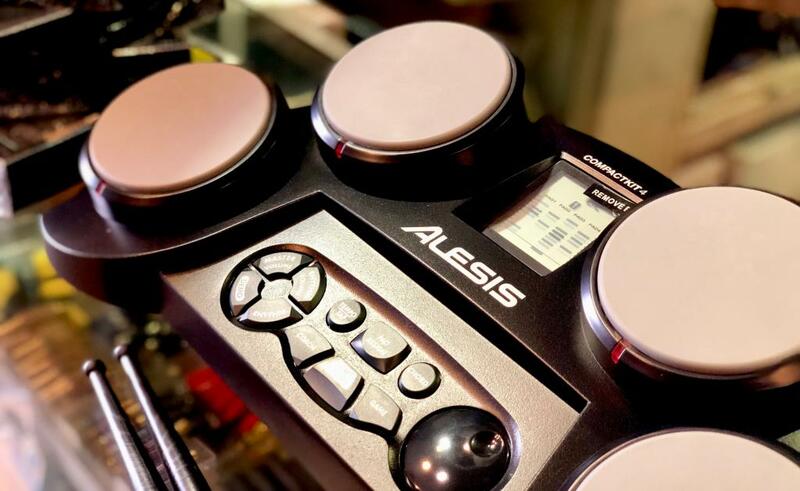 Anyway, here’s the full story of what we think about the Alesis Compactkit 4. This comes with 4 pads which is pretty few as you can see. But then again, as we said, this is a drum pad for kids. It won’t simulate the same experience as if you were playing on a full kit but all the same this will serve for the kids. Also, as you probably already expect, there aren’t so many sounds available on this drum pad. Only about 70 drum sounds with 10 preset kits. The Alesis Compactkit 4 does not feature any inputs which is quite a shame. You won’t be able to connect any external device here to play along with your favorite music. Fortunately though, there’s an output jack for headphones or amp, depending. If you asked whether you can connect this to a computer, really think about it. Do you think this drum pad has this feature. Exactly! It doesn’t. Nonetheless, we find it really nice that this drum pad comes with a control panel that features an LCD screen. It makes it easier to interact with the device. As for power, there’s an AC power adapter here but you can also use batteries, Polaroid C batteries preferably as the makers advise. Finally, the Coach and Game functions on this kit are really cool ways to teach kids drums. However, we still think this kit is just a teeny bit overpriced. Coach and Game are genius tools for teaching kids to the drums. Control panel is highly intuitive for kids as buttons are few. 80 different sounds which are assignable to individual drum pads. This is great as it is not too overwhelming for kids and they can learn faster. 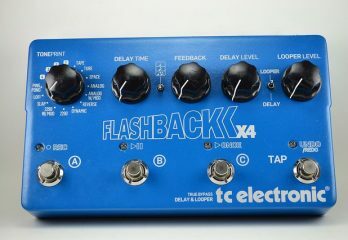 Features only 4 pads without any foot pedal. No built-in metronome or recording function. Sticks are lighter and smaller than proper kids which isn’t great for building proper skills. 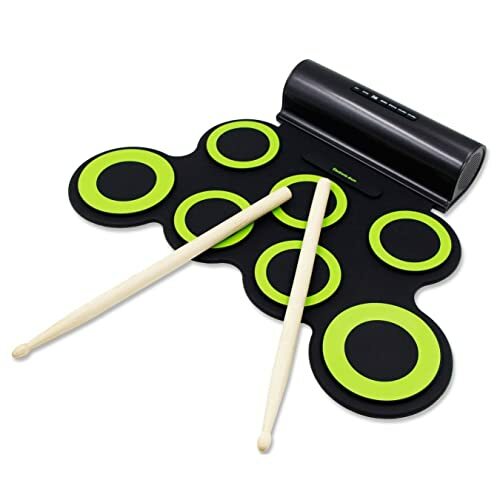 The Paxcess Electronic Roll Up Drum Practice Pad is another great drum pad for kids. It features a roll up surface which increases the portability of the device. 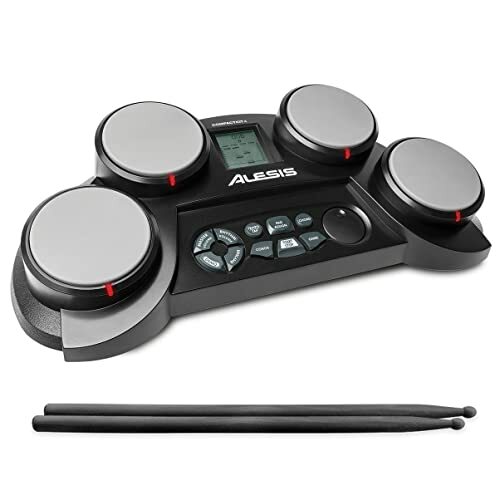 Plus, unlike the Alesis Compactkit 4, this features 7 pads. That is, 1 snare, 3 tom drums, 1 hi-hat, and 2 cymbals. Like big boy drum pads! This drum pad also features 2 foot pedals – one for the hi-hat open and closed sounds, and the other for the bass drum. Flanking the drum pad on either side also, are two built-in speakers with an output of 2 Watts. But silent practice is also achievable thanks to the headphone jack on here. Now, besides the headphone output, there’s also a USB output which allows you to charge your drum pad. Plus, you can also use the USB output to connect your drum pad to your computer, if you so please. We prefer the Paxcess to the Alesis Compactkit 4 for its price/feature balance. Nonetheless, it still has its shortcomings. Read on to find out what they are. The rolling surface makes this pad easy to carry around. Works as a MIDI trigger. Battery is powerful – lasts up to 8-10 hours! Attractive colors for the kids. The setup of this drum pad does not resemble that of an actual drum kit. So, it might be difficult to transfer skills built on this drum pad to an actual drum set. Foot pedals feel a little too lightweight and flimsy. Sticks are shorter and lighter than real drum sticks. 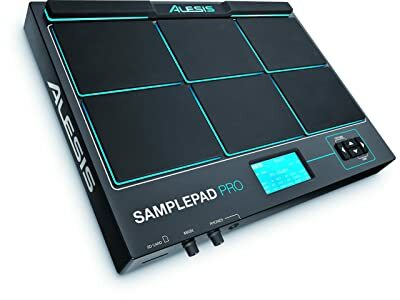 The Alesis SamplePad is a much better drum pad than the Alesis Compactkit 4 which Alesis made with the kids in mind. This model features 8 different pads which are pretty sensitive to velocity. This means that they will pick up on every nuance when you play. Furthermore, the Alesis SamplePad Pro features many built-in drum sounds and kits. 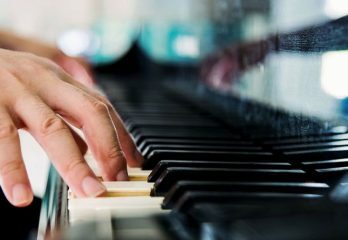 These sounds range from electronic hits, to musical synth pads, to world music, to acoustic sounds. What’s even more impressive is that it is expandable by an SD card up to 32GB in size. Moreover, the drum pad itself is also expandable as there are two inputs for two additional pads. This is in addition to the hi-hat and kick controllers already here on this drum pad. Your possibilities are nearly endless here. We also found the Alesis SamplePad Pro to be a truly versatile model. It’s great for practice, it can hold and loop your own custom samples. Plus, it can also serve as a great MIDI controller for DAWs and other devices. Lastly, we won’t fail to mention that this device looks really cool. What’s even cooler is that the pads light up when you hit them! Totally lit (pun very much intended)! All in all, Alesis impressed us with this model. For a product in this price range, features are sufficient. Features custom sampling as well as MIDI capability. Drum pad is expandable, sounds are also expandable too. Not as sensitive as some advanced players might like. Time issues when switching between kits. Roland is a much loved brand so, it’s no surprise that the Roland Octapad is a favorite among many drummers. It’s super pricey so you want to keep that in mind when contemplating getting this drum pad. The Octapad is great for many reasons though. For one, it comes expandable. Plus, many drummers have found that they were able to make a mini electronic kit out of the drum pad. All they had to do was to add a kick/hi-hat pedal and a snare mesh head. Of course, throwing a crash/ride cymbal pad would also be great. Now though this feature is great the one feature everyone is raving about is the Phrase Looping. The Octopad allows you to loop 3 separate instruments onto your drum pad. Your instruments can range from kits to synth sounds to percussion instruments. Plus, there are options to delete, pause, etc. Although 3 instruments might seem a bit few, keep in mind that you’d be able to swap them out quick too. An excellent drum pad by all standards! Also features Phrase Loop feature. Another Roland up for review and the brand is still stealing hearts. Its Roland SPD-SX is quite overwhelming when it comes to its features although that’s in a good way. The model is also pretty versatile with a high level of sophistication. This drum pad comes with a 2GB memory which means you get 360 minutes of mono sampling. All this without needing the help of external memory! Also, in here, you get 9 velocity-sensitive pads with two external dual-trigger inputs and lots more. Furthermore, the sounds here are staggering. Roland packed as many as 900 preloaded percussion sounds here! Plus, you also get 9 empty kits which allow you upload your own custom sounds onto your drum pads. There are USB ports of course which allow you import your favorite samples from your computer. Once again, Roland hits a home run with its instruments! Ample internal storage space of 2 GB. Pads are velocity-sensitive and also boast a fantastic rebound. The Yamaha DTX Multi Pad is another highly impressive drum pad closely resembling the Roland SPD-SX. With 12 pads, this drum pad offers 3 more pads over the Roland SPD-SX. 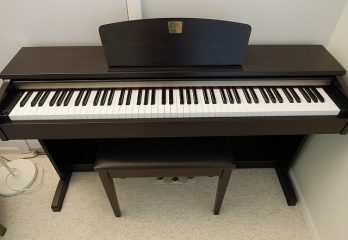 It is a fantastic model with a vast inventory of sound and other features you’d be impressed by. Now, one of the things we love the most about this drum pad is that it comes with ultra sensitive pads. For those who do hand drums, this is the drum pad for you. It works with sticks, hands or fingers. It is that sensitive. Again, this is an expandable drum kit. It comes with 3 inputs with 2 of the three being dual inputs. These inputs allow you use dual zone pads. Or you could also split them into two separate zone pads using a splitter. It’s great sample pad and we love the features here, although it does have its shortcomings. Read on to find out what. Can play with sticks, hands or fingers. 64MB internal memory space is a nit limiting. The Rockjam Portable MIDI Electronic Roll Up Drum Kit comes in two different versions. There’s the one with a built-in speakers, and there’s the one without. Today, we’re reviewing the drum kit with built-in speakers. Now, which of these drum kits do we recommend? Can you guess? Of course the one with built-in speakers, we’re reviewing it after all. Why? Well, the price difference between both drum kits isn’t gaping, so why not? 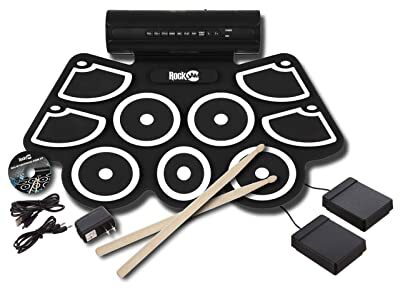 That said, the Rockjam Portable MIDI Electronic Roll Up Drum Kit won’t blow your mind but we can assure you one thing. This thing will do just what says it would – no more, no less. And we actually like that about the device especially for its price. Its rolling surface makes the unit highly portable. Plus, with 9 pads, this drum kit is quite versatile. And let’s not forget that it also comes with foot controllers for the kick drum and hi-hat as well. 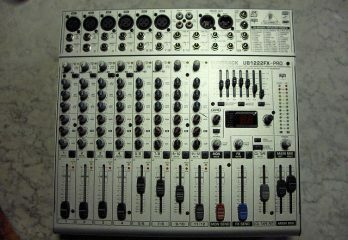 With an MIDI USB output, you can easily hook this up with your computer. And there’s also the headphone jack for quiet practice. Finally, this runs on an AC adapter. However, it could also run on batteries if you need it wireless. Small and compact enough to be highly portable. Comes with 9 pads included. Can be used as a MIDI trigger with a PC. Comes with a built-in recorder. Cord is a bit short and not quite durable. Included sticks are lighter and smaller than the standard. Finally, we have the Yamaha DD75. This is a great drum pad from one of the masters in the music industry. It comes with 8 pads which are more than enough and then there are the pedals also which are quite good enough as well. Now, this is a pretty basic drum pad so don’t expect the Roland level of sophistication here. In fact, there are some who seem to find the DD75 to be somewhat old school. But that said, this is a pretty intuitive setup. The sounds on the drum are also pretty good. However, what we really love is that there’s a whole plethora of them. The speakers also do a pretty decent job of replicating these sounds well. We do not understand why Yamaha did not include a power cord here. Seems like a pretty obvious point that they missed. The pedals too aren’t exactly great. Overall, for a basic drum pad with mostly “just there” features, this drum pad seems a little overpriced. Comes with 8 pads intuitively arranged. Drumming plays a vital role in most pieces of music and with the advent of electronic drums, the entire music scene has witnessed a complete revolution. Now, for many drummers, a full electronic drum kit might be somewhat out reach. Think about cost and size and all whatnot. Ergo drum pads… Drum pads are way more convenient and affordable alternative to full drumming kits. 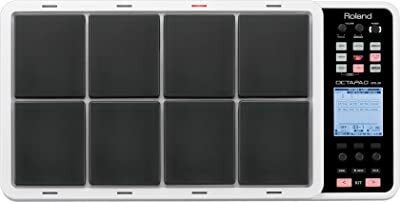 If you want to learn more about electronic drum pads, then read on. We prepared a quick crash course for you. The primary difference between an electronic drum pad and an electronic drum kit is size. That much is obvious, right? Drum pads are much more compact than electronic drum kits, as their name already suggests. An electronic drum pad only measures a few square feet in size. And since it comes in a single panel, quite unlike an electronic drum kit, you can simply place it on a tabletop and you’re golden. 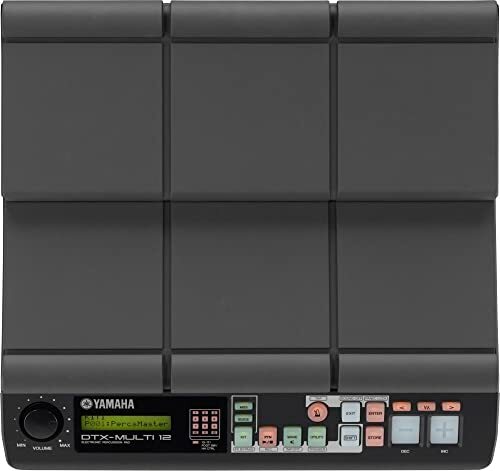 So, how does this single panel drum pad work? First thing you should know is that an electronic drum kit bears a semblance to acoustic drum kits in its arrangement. Understandably, the drumming areas on a drum pad will be significantly smaller than on a full kit. However, most electronic drum pads still come in an intuitive setup. That is, most pads still retain that standard drumming configuration that most drummers are used to for the toms, snare and cymbals. What Are The Benefits Of Using An Electronic Pad? 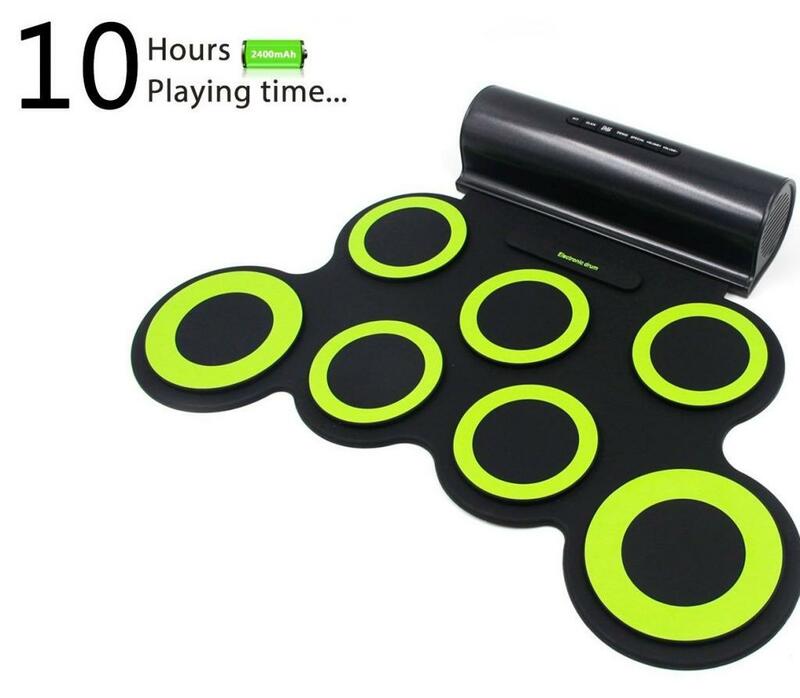 There are many benefits of using an electronic drum pad. In the first place, it significantly reduces your expenses as you’ll be spending a lot less getting drum pads instead of a full kit. However, there are other benefits besides affordability. Check them out. Now unlike electronic drum kits, electronic drum pads take up significantly less space. You won’t be needing external cables to connect anything or any rack at all. Well, there are some electronic drum pads that support foot pedals for the kick drum. But besides those, you’ll hardly need any hardware. 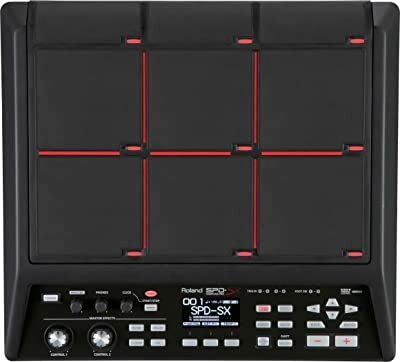 So, say you live in a dorm or your apartment is really small and you need something that works with your space, consider electronic drum pads. You’ll be able to practice as much as you can but with only a fraction of the space that a full drum kit would have taken. Another reason electronic drum pads are popular among drummers is the fact that it is portable. Of course that’s easy to deduce from the fact electronic drum pads are small in size. So, you’ll be able to conveniently carry them around and play in any location you please. On the other hand, it’s impractical to even think about moving a full kit around. True, you can disassemble many electronic drum kits into a smaller size. Nonetheless, you still can’t compare the portability of that with the portability of a drum pad. For one, you never have to dismantle a drum pad, so that’s already one area where the electronic drum pad one ups the full kit. You also don’t have to go through the inconvenience of setup when you arrive at your destination. All the components are already onboard. Another area where drum pads shine is in small performances and jam sessions. Since they don’t dominate the space like their kit counterpart they blend in seamlessly in such environments. The best part though is that they still provide similar functionality to what a drum kit produces. Just like we mentioned in the last sub, electronic drum pads are portable so they automatically make practice more flexible and convenient. You no longer have to lose valuable practice time just because you’re on vacation. 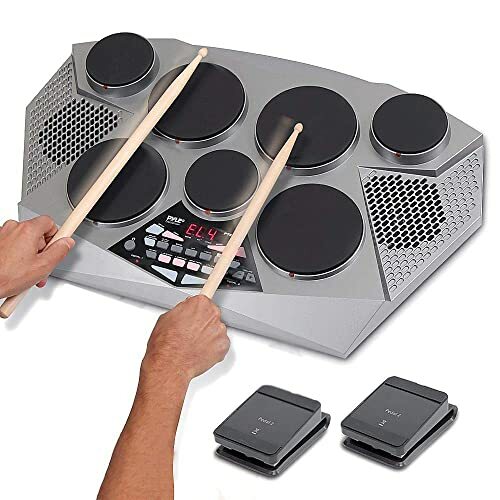 Also, some electronic drum pad models come with certain features that aid practice such as play-along songs to learn specific techniques. Built-in metronomes are also common in electronic drum pads, helping the drummer practice tempo and time keeping. Furthermore, there are drum pads that come with recording capabilities, although limited. This feature helps drummers listen to themselves play in segments. Then they can review and make corrections. 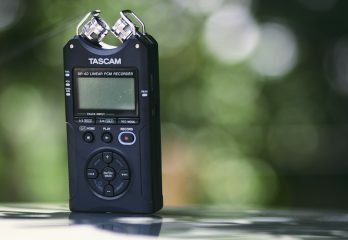 Do I Need An Amplifier For My Electronic Drum Pads? Well, it really depends on what you intend to use your electronic drum pads for. It’s very possible to connect your drum pads to an amp or any PA system using instrument cables. Plus, there are drum pads that also come with a headphone input as well. How Do I Load My Samples? Not all drum pads come with the ability to load custom samples, and that’s the first thing you should know. However, if you do end up with one that allows you to do so, you’d most likely need a USB drive or SD card for that. Whatever the case, make sure you check out the specifications of the model you settle for before you load your samples. Different models require different file formats and bitrates. For example, there are some models that only work with 16 bit wav files. Is There A Big Difference Between High-end Drum Pads And Low-end Drum Pads? 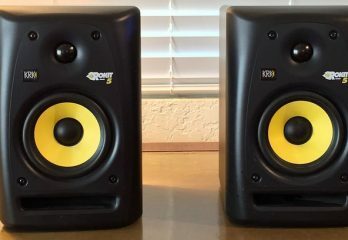 The big difference between high end drum pads and low end drum pads would be in build quality. Higher end drum pads usually come with a sturdier build than lower end drum pads. You’ll appreciate this even more if you’re going to be gigging regularly, as higher end models would last longer. Also, in performance, many lower end drum pads usually trigger some unwanted problems such as cross-talk. On the other hand, higher end drum pads usually produce better sounding on-board sounds. Lastly, a major difference between high-end and low-end drum pads is in the speed of the device as well as the features they present. This is especially important when switching kits in the middle of loading external samples. To record your electronic drum pad onto your computer, you’ll need an audio interface. You’d have to connect the output from the pad to the audio interface’s inputs using instrument cables. The interface, on the other hand, connects to your computer using a USB. Another way to connect your electronic drum pad to your computer is via MIDI. This way, you’ll be able to trigger the sound you want from your DAW rather than use the on-board sounds on your drum pad. Can I Connect Other Electronic Drum Pads To My Drum Pad? To know whether or not this is possible, you want to check the external inputs of your pad. It is possible that your drum pad supports other electronic drum pads or cymbal pads. Also, some drum pads also come with inputs for hi-hat pedals. Then you could add a kick pad if possible. It’s actually advisable you do. 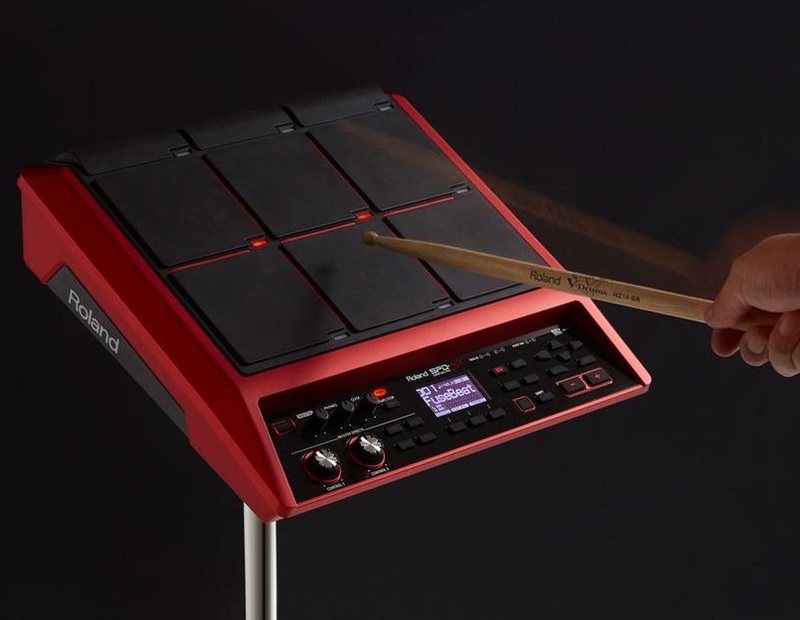 What Are the Limitations Of An Electronic Drum Pad? Electronic drum pads may pack so many benefits, it’s nearly impossible to think that they could even have any con. Nonetheless, they do have their limitations. First of all, drum pads don’t have the same spacing that full kits have among their components. So, many times, it is practically impossible to get the same playing experience you’d get from playing on a full kit. In the end, it could portend some challenges for the drummer as they won’t be able to achieve that proper form they need. Again, the modules you find in drum pads are not as powerful as the ones you find in full drum kits. Granted, you’ll find higher end drum pads that come with several user preset options as well as ample libraries. Still, they do not match up to what you find on a drum kits. This becomes a bit problematic when you need to record or perform live. 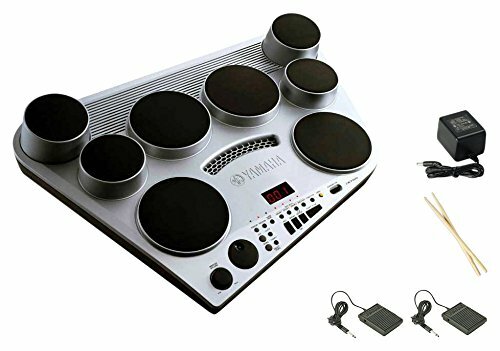 Our best electronic drum pads is the Pyle Pro Electronic Drum Kit. It gives a perfect blend of price and features, and is a really great all-rounder. 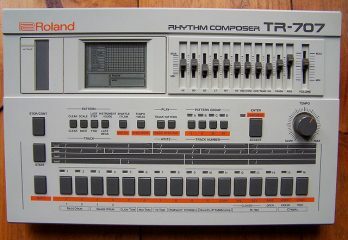 For the expert model though, we recommend the Roland Octapad SPD-30. It’s quite pricey yet it is highly advanced and highly sophisticated.